Costume worn by Tamara Karsavina for her solo Mme de Maupin. The programme for the performance at the Arts Theatre, London, 27 May 1930, indicates that the costume was made by Grace Lovat Fraser. 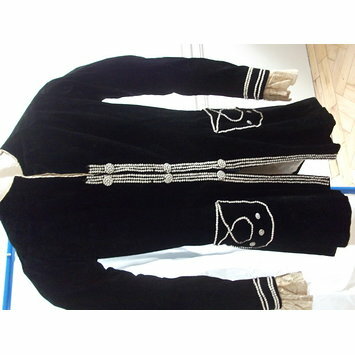 Black velvet jacket with full skirt with white silk lining. The jacket fastens in front with hooks and eyes. 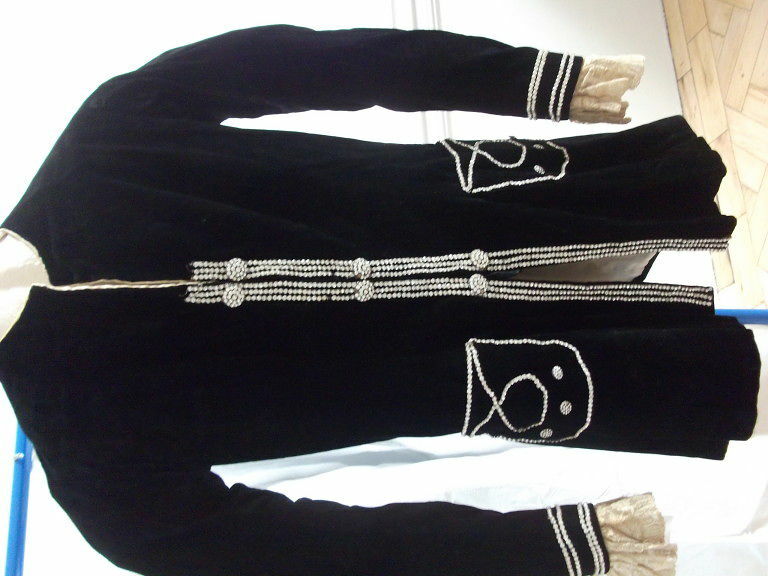 It is decorated down the front with two vertical triple rows of small rhinestones and three pairs of similarly decorative buttons. Rhinestones pick out a pocket pattern on both sides of the skirt, each with three decorative buttons. There are two double bands of rhinestones at each cuff, below which are sewn in cuffs of cream lace. The back is undecorated. Costume worn by Tamara Karsavina for her solo, Mme de Maupin. No designer is credited but Arts Theatre programme 27 May 1930 indicates it was made by Grace Lovat Fraser.